Last month my husband, baby boy, and I took a trip up the California Coast. We didn't know where we were going, we just drove. It was such an adventure! 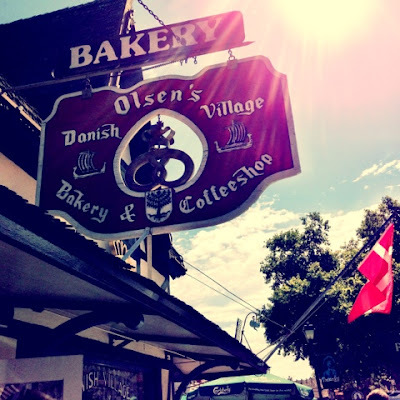 The first night we stopped in Solvang, a small Danish town north of Santa Barbara. The next morning we explored the town and of course I had to stop in a bakery for some "breakfast." The bakery of choice was Olsen's Danish Village Bakery & Coffee Shop. 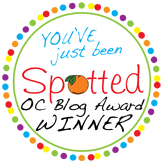 I didn't find out until later that they were featured on the Food Network show "Kid in a Candy Store." 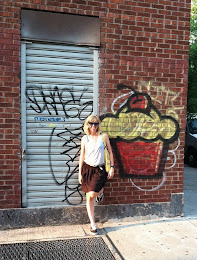 I love bakeries! You get to have your pick of anything! 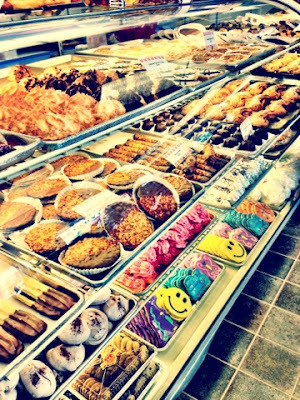 Croissants, candy, chocolate, donuts, cookies, YUM! One thing I noticed was all the almonds. What's with Danish desserts and almonds? After drooling on the display window for a few minutes, I finally made my selections: Danish waffle, chocolate covered almond lace cookie, and a loaf of jalapeno cheddar bread. 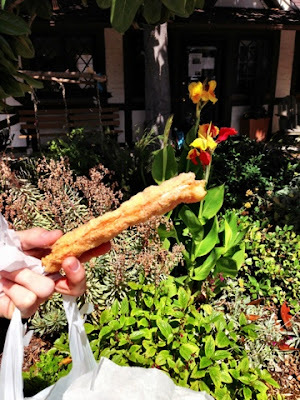 What's a Danish waffle? It's a light puff pastry filled with raspberry jam and buttercream. I had no idea what it was going to be, but it was love at first bite! It was so light and delicious, I wish I didn't have to share it with my husband. We munched on the jalapeno cheddar loaf throughout the weekend. I loved the pockets of jalapenos and soft bread, still moist even after a few days. Everything was so tasty! I loved the huge selection of goodies to choose from. The prices were decent and the quality was excellent. 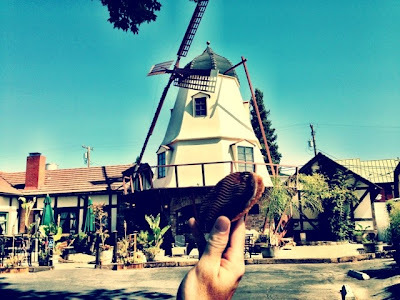 This is a must-do if you ever visit the quaint town of Solvang.